You can choose a variety of locations at checkout. If you would like, please contact us for more information about the areas. The maximum people per group is 8. For the area of Reserva do Garajau, your group must have a minimum of 2 people. For other areas, the minimum is 1 person. What to bring: Swimsuit or board-shorts, towel, hat, sun protection, adequate shoes, water, and a light meal/snack. Chosen starting point may change due to weather or sea conditions. In that case, we will take you to a very similar area with better conditions. You can cancel up to one day in advance with 100% money reimbursement. There is no reimbursement for later cancellations. 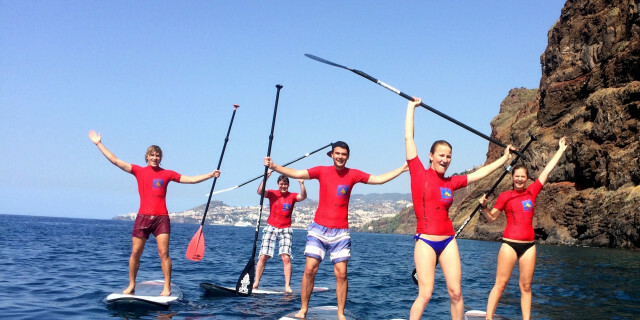 Stand up paddleboarding (or SUP) has been gaining popularity, and it's no surprise. This versatile activity gives you access to sea views often only visible from boats, while a close-up of amazing marine life awaits just a quick jump away. We start this adventure with a quick lesson adapted to your experience, so whether you're a beginner or more advanced, we'll make sure you get the most out of your day. 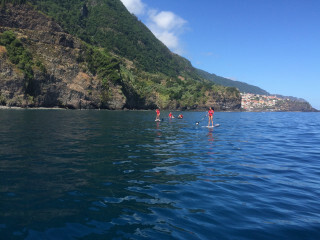 The offered locations are all hand-picked to show off the best of Madeira's breathtaking 160-km (99-mile) coastline as you paddle across calm, crystal blue waters. Once we drive you to our meeting point, our expert instructors provide all equipment and start with an introduction to techniques you'll be learning or improving. After a bit of practice on land, we wade into the calm water, carefully mount our board, and begin paddling through the bay at a relaxing pace. You can remain on your knees or stay seated until your confidence builds. As we push forward, we often see dusky groupers and moray eels racing below the water's clear surface. Surrounded by beautiful cliffs reaching into the sea, you easily get comfortable enough to stand tall and begin exploring. We offer multiple locations for this experience. The first and most popular spot, Reserva do Garajau (Garajau's Natural Reserve), was made to protect this gorgeous coastal area and to repopulate the unique marine fauna. The second option is Baia d'Abra, with towering volcanic rock formations lit up by the Spanish sun. Your third option is the north coast's Seixal, where the famous "Bride's Veil Waterfall" falls dramatically into the sea. 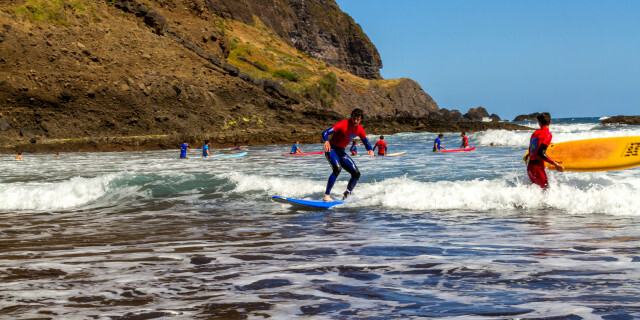 The fourth option for your starting point is Caniçal, a little fishing village with a sandy beach that is rare in Madeira. Finally, the fifth option is Cabo Girão, a large sea cliff that lies between two river-valleys that flow into the Atlantic. 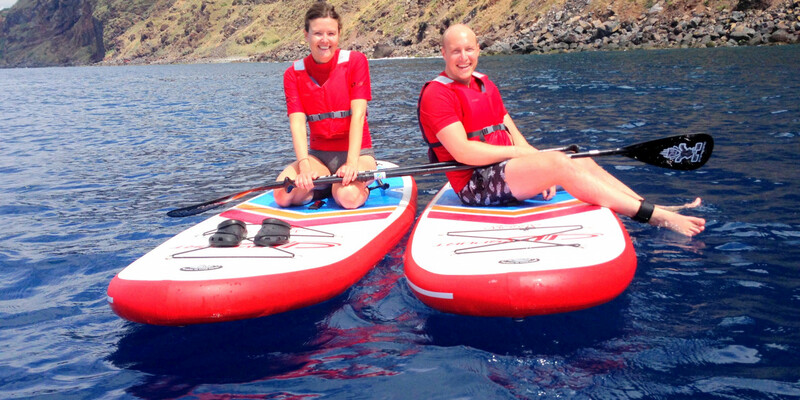 Wherever you decide to practice your paddleboarding skills, there is a surprise at every turn. After 2.5 hours of drifting across the ocean, we are transported back to our pickup points. 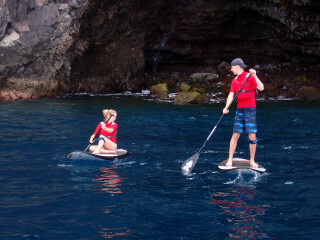 You have the afternoon free to stretch your legs, relax, and smile about having discovered the magic of paddleboarding around paradise. Great experience, an absolute must!